[OnyxEpoch] does not reveal which of the above categories he falls into, if any, but we’ll go out on a limb and guess that it’s a hackerspace because it would work really well in such an environment. Built into a sturdy steel enclosure, the guts are pretty simple — an Arduino Uno with shields for USB, an SD card, and a data logger, along with an LCD display and various buttons and switches. The heart of the thing is a USB magnetic card reader, mounted to the front of the enclosure. To unlock the machine, a user swipes his or her card, and if an administrator has previously added them to the list, a relay powers the tool up. There’s a key switch for local override, of course, and an administrative mode for programming at the point of use. Tool use is logged by date, time, and user, which should make it easy to identify mess-makers and other scofflaws. We find it impressively complete, but imagine having a session timeout in the middle of a machine operation would be annoying at the least, and potentially dangerous at worst. Maybe the solution is a very visible alert as the timeout approaches — a cherry top would do the trick! There’s more reading if you’re one seeking good ideas for hackerspace. We’ve covered the basics of hackerspace safety before, as well as insurance for hackerspaces. [G6EJD] wanted to design a low power datalogger and decided to look at the power consumption of an ESP32 versus an ESP8266. You can see the video results below. Of course, anytime someone does a power test, you have to wonder if there were any tricks or changes that would have made a big difference. However, the relative data is interesting (even though you could posit situations where even those results would be misleading). You should watch the videos, but the bottom line was a 3000 mAh battery provided 315 days of run time for the ESP8266 and 213 days with the ESP32. The Bus Pirate is one of our favorite tool for quick-and-dirty debugging in the microcontroller world. Essentially it makes it easy to communicate with a wide variety of different chips via a serial terminal regardless of the type of bus that the microcontroller uses. Although it was intended as a time-saving prototyping device, there are a lot of real-world applications where a Bus Pirate can be employed full-time, as [Scott] shows us with his Bus Pirate data logger. [Scott] needed to constantly measure temperature, and the parts he had on hand included an LM75A breakout board that has a temperature sensor on board. These boards communicate with I2C, so it was relatively straightforward to gather data from the serial terminal. From there, [Scott] uses a Python script to automate the process of gathering the data. The process he uses to set everything up using a Raspberry Pi is available on the project site, including the code that he used in the project. [Scott] has already used this device for a variety of different projects around his house and it has already proven incredibly useful. If you don’t already have a Bus Pirate lying around there are a few other ways to gather temperature data, but if you have an extra one around or you were thinking about purchasing one, then [Scott]’s project is a great illustration of the versatility of this device. It will be easy to keep your exercise routine on track if you don’t have to do anything at all to log your workouts. 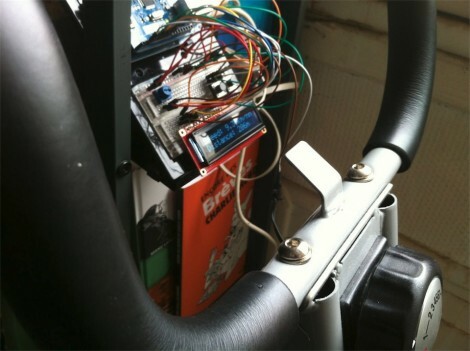 [Reefab] developed this add-on hardware for his exercise bike that automatically logs his workout on the Internet. He’s using RunKeeper to store and display the workout data. They offer a token-based API which [Reefab] implemented in his Arduino sketch. The hardware to grab data from the exercise bike is quite simple to set up. A rare-earth magnet was added to the fly-wheel with a reed switch positioned next it in order to measure the number and speed of rotations. This is exactly how a consumer bicycle computer works, needing just one accurate measurement corresponding to how far the bike travels with each revolution of that wheel. In addition to the networked-logging feature [Reefab] included a character display so you can follow your speed and distance data during the workout.